← Bathroom? 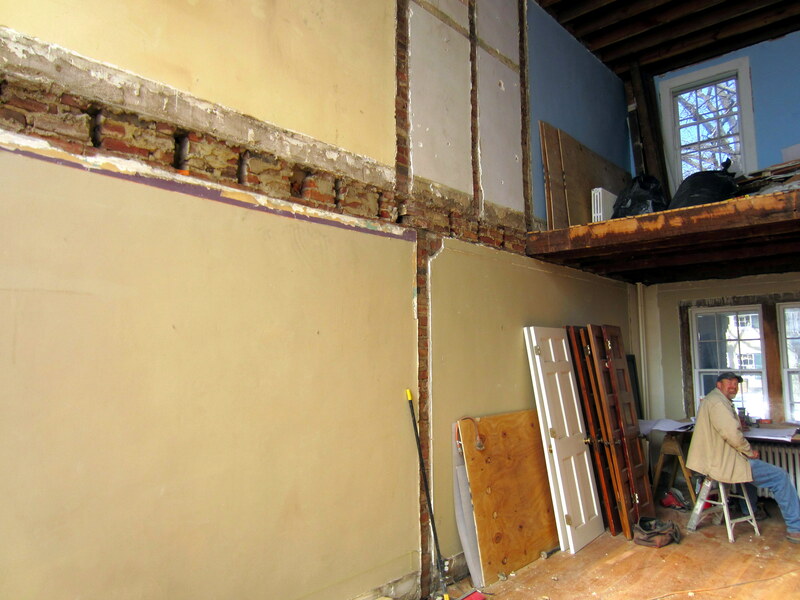 We Don’t Need No Steenking Bathroom! 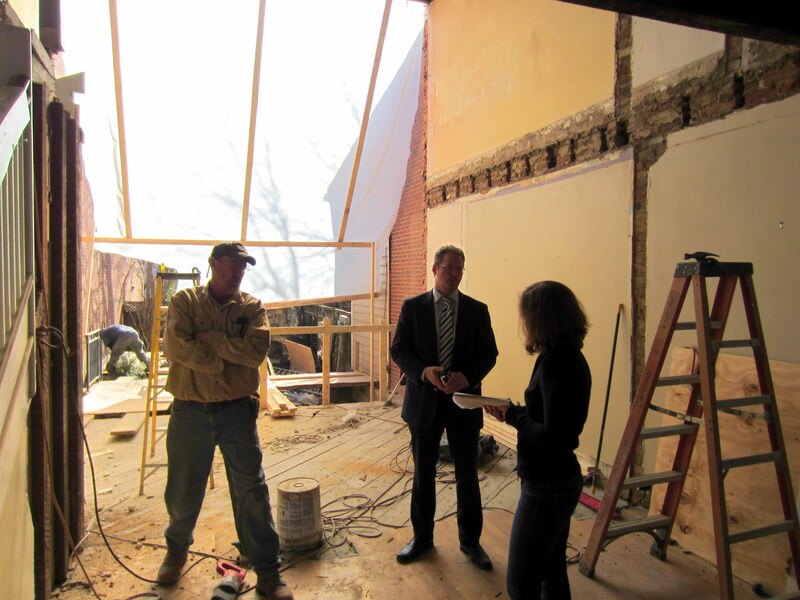 Dave, the site manager, consulting with Mary, the project manager, at what remains of the second floor. 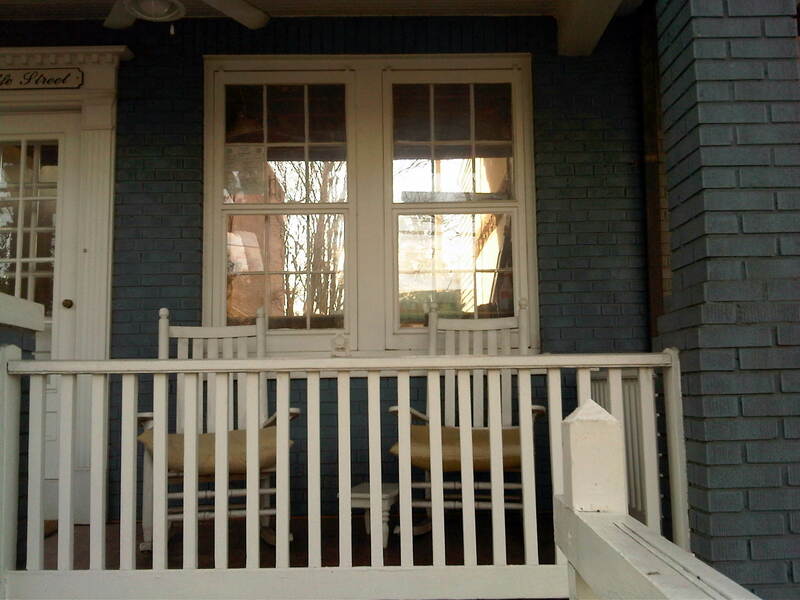 We intended for the original railing to remain, but you’ll see what happened to that in a few pics. 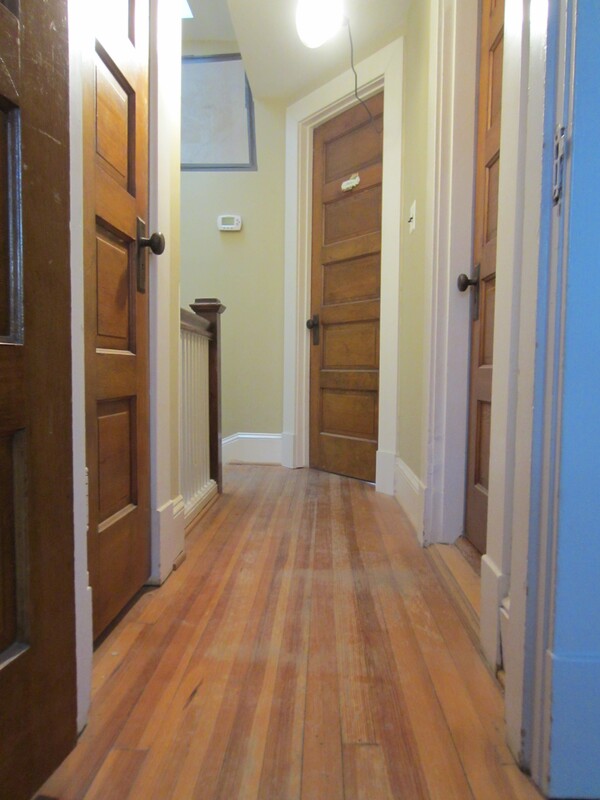 (Note the stained wood newel post barely visible to the right of the of the white railings . . .). 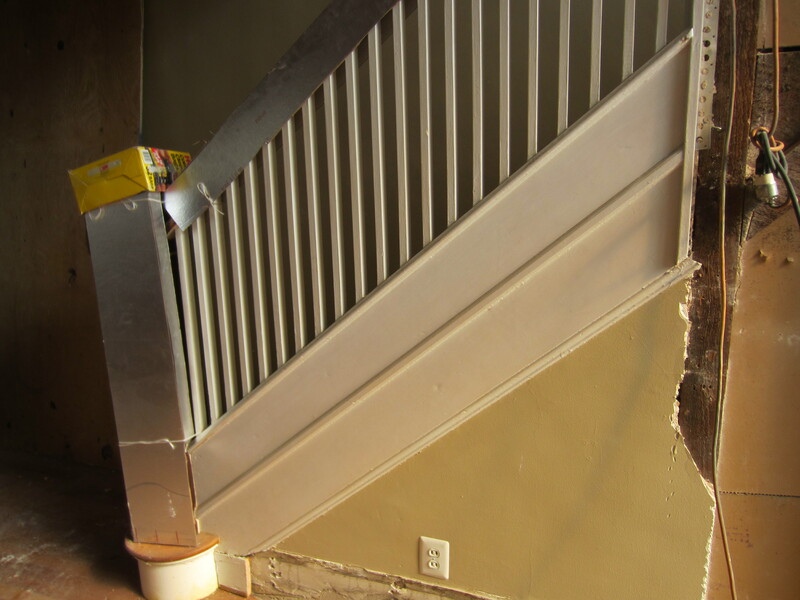 And then, in the words of Gracie – a catastrophe! 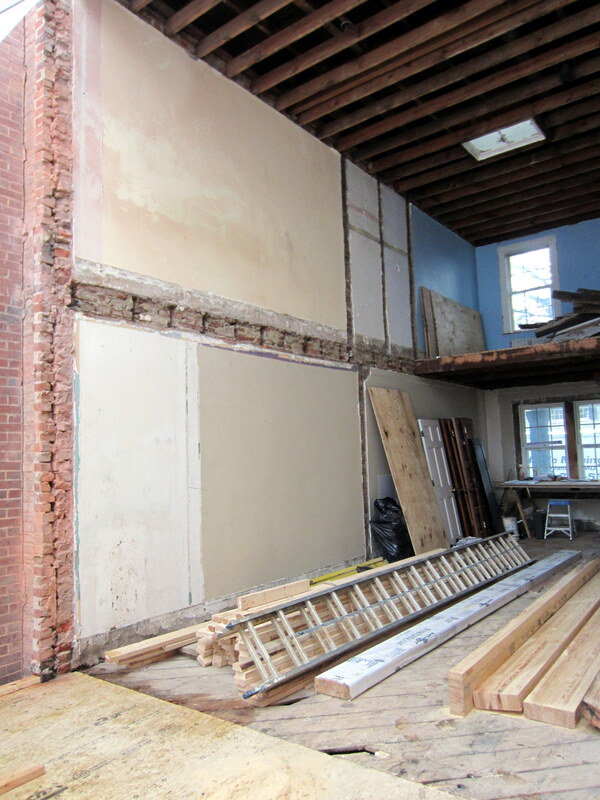 No more floor. 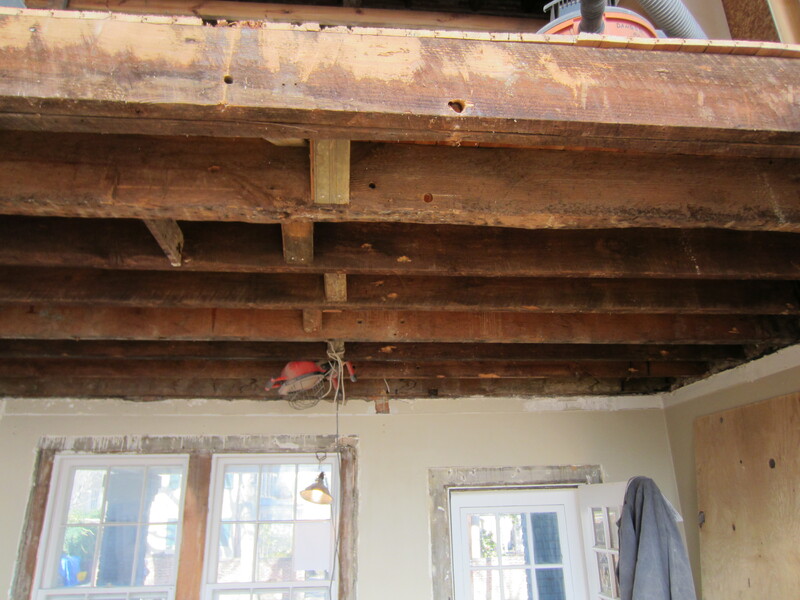 No more joists. 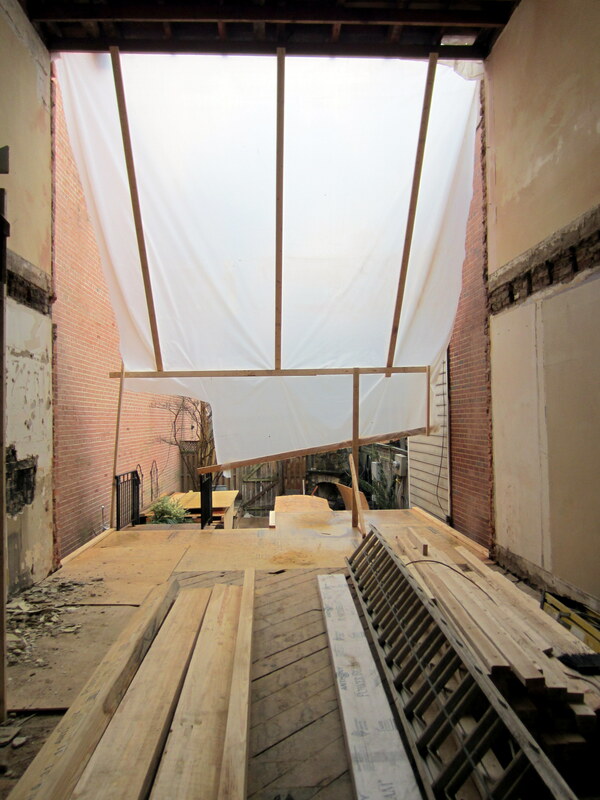 No more much of anything – we’ve reached the peak of the demo activities with the photos below. 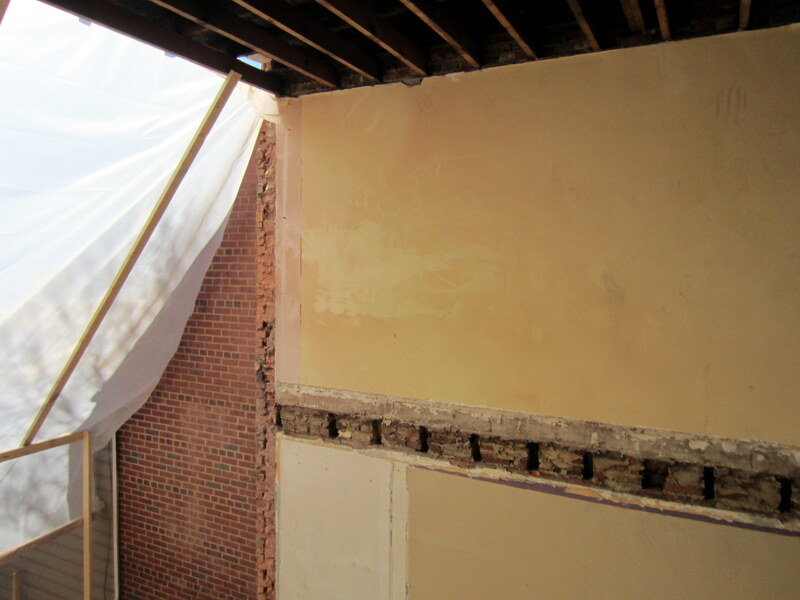 Because of the age of the house, the walls are solid brick, so the joists slotted into the holes shown here. 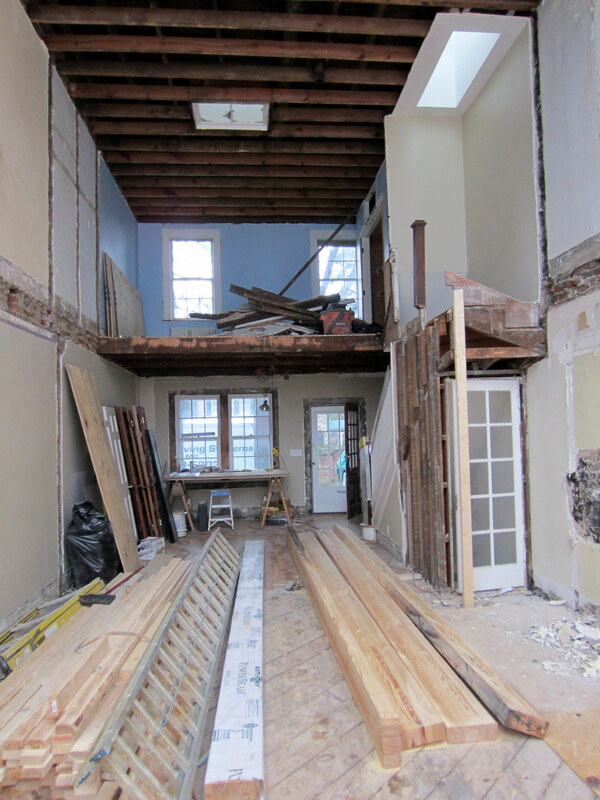 Although the joists were all sound, they needed to be removed and replaced with ones that ran north/south (between the front and back), rather than east/west to accommodate the new mechanical and plumbing design for the open floor plan on the first floor. 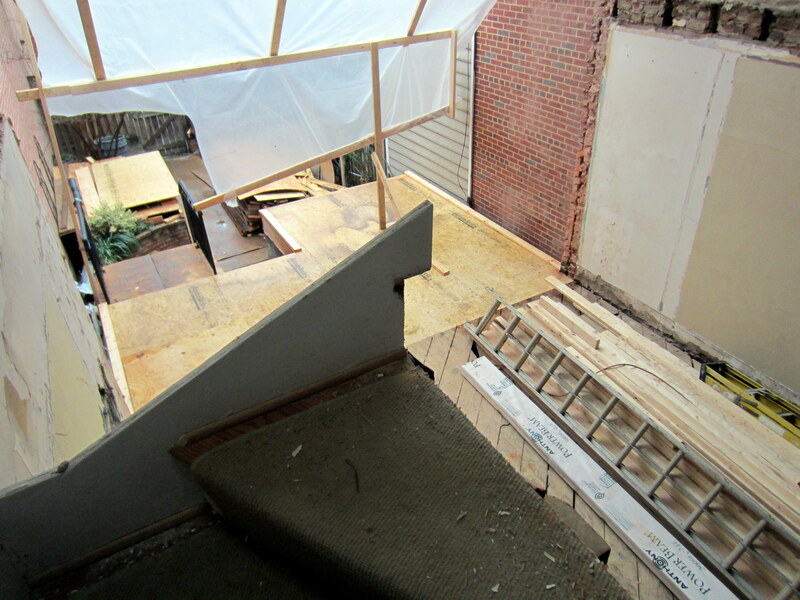 Looking down from the top of the staircase to nowhere after the catastrophe. 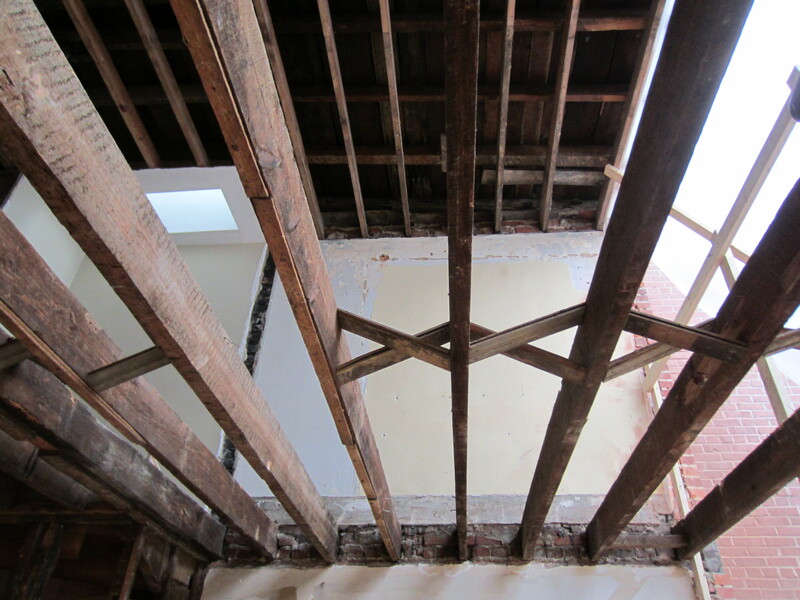 The extent of the joist and framing removal between the first and second floors. 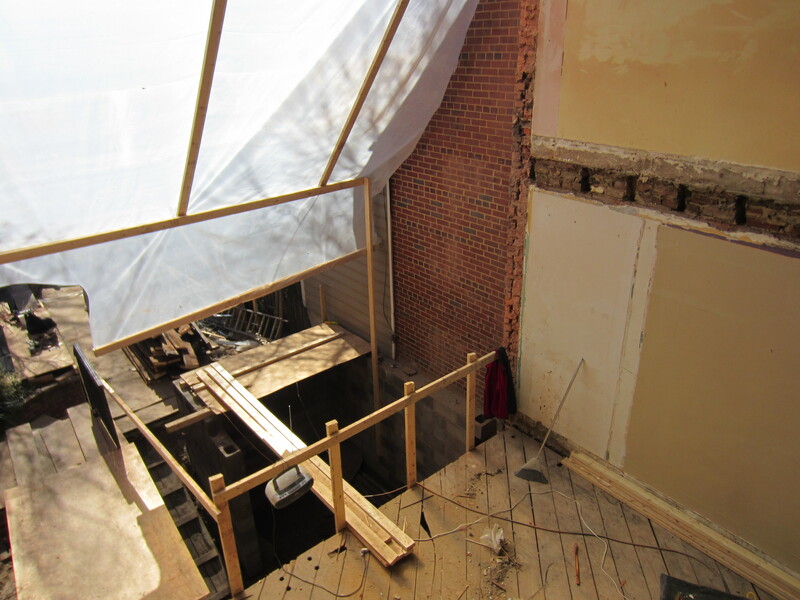 This is a view from the first floor of the remains of the linen closet on the second (the entry to which was through the world’s narrowest 5-panel door, which is the only door we’re retaining and refurbishing, since it’s so cool). 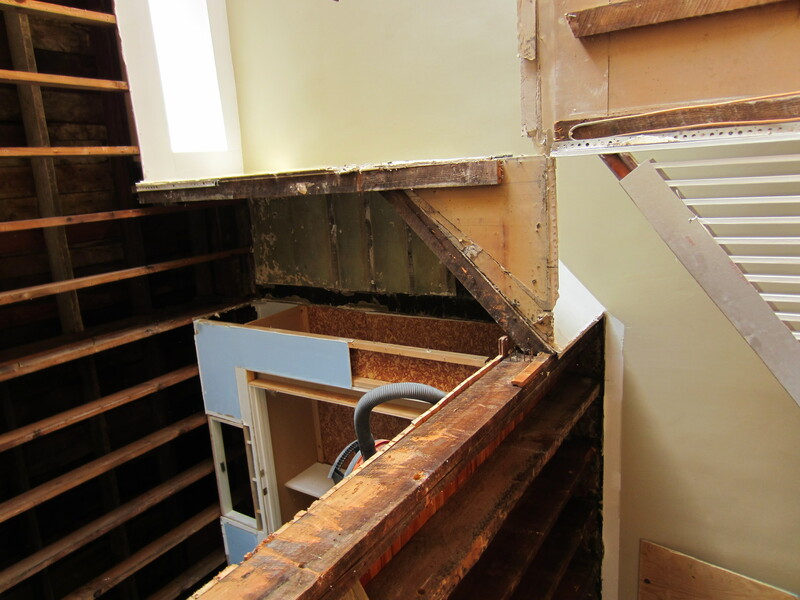 The stairs and railing on the first floor will be retained as one of the only original elements of the old house, so it’s being protected. 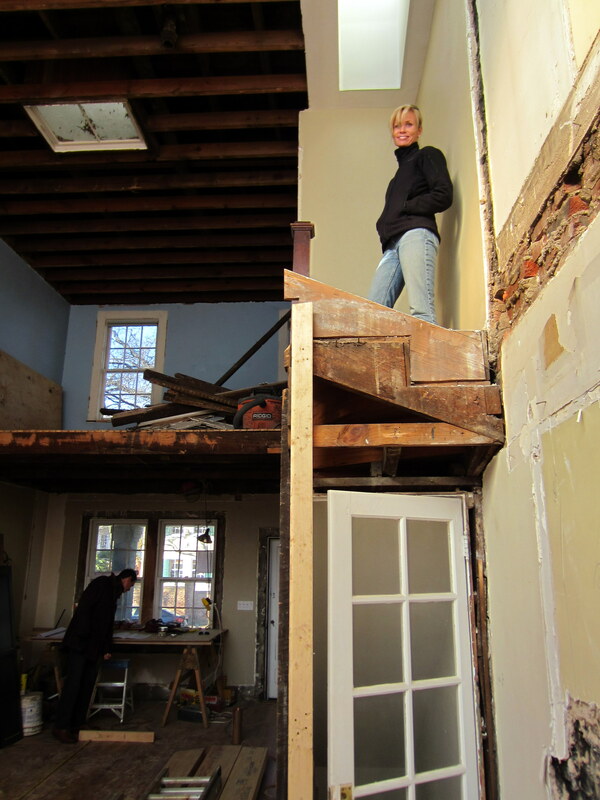 Here’s what’s left of the upstairs railing – just the old newel post as a lone sentinel watching over the destruction. 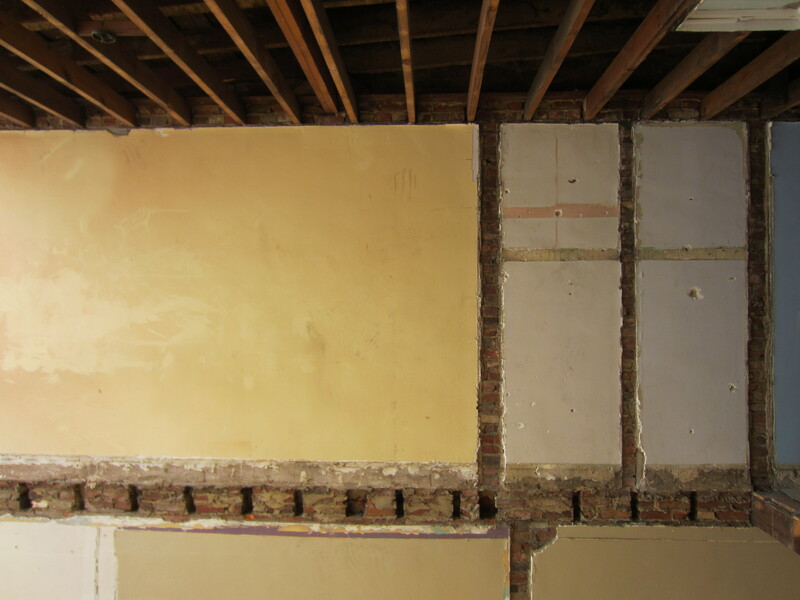 Evidence of earlier renovations. 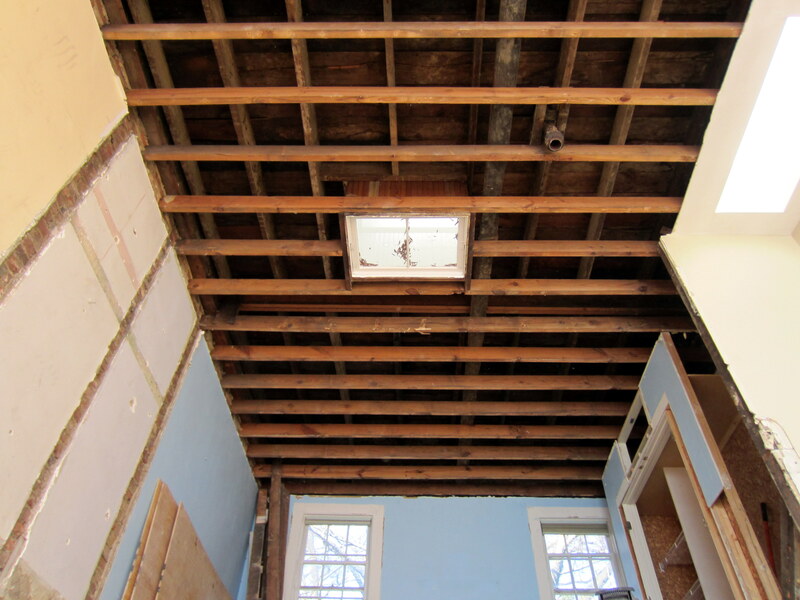 A few years ago, we installed recessed lighting in the living room – these are the electrician’s holes through all of the joists from the front of the house to the dining room to run electrical. 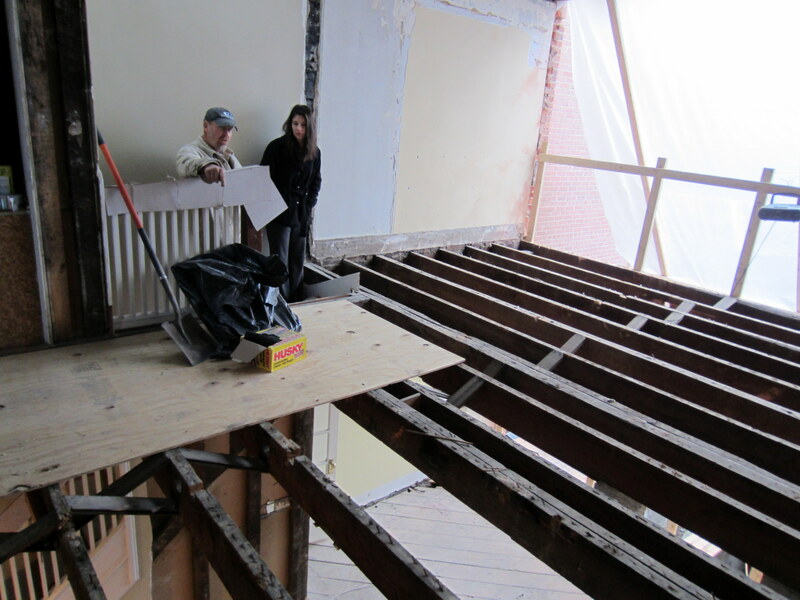 Dave, Ben (our first architect), and Natalie (our new architect) reconsider the joist height spec’d for the second floor. 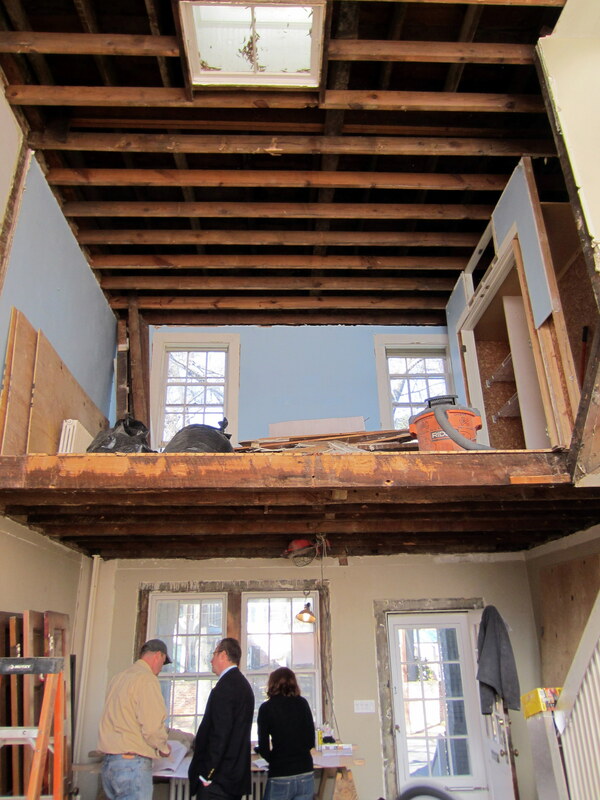 A view all the way from the first floor to the exposed rafters and old skylight hanging forlornly from the second floor ceiling. Lisa checks out the new view. 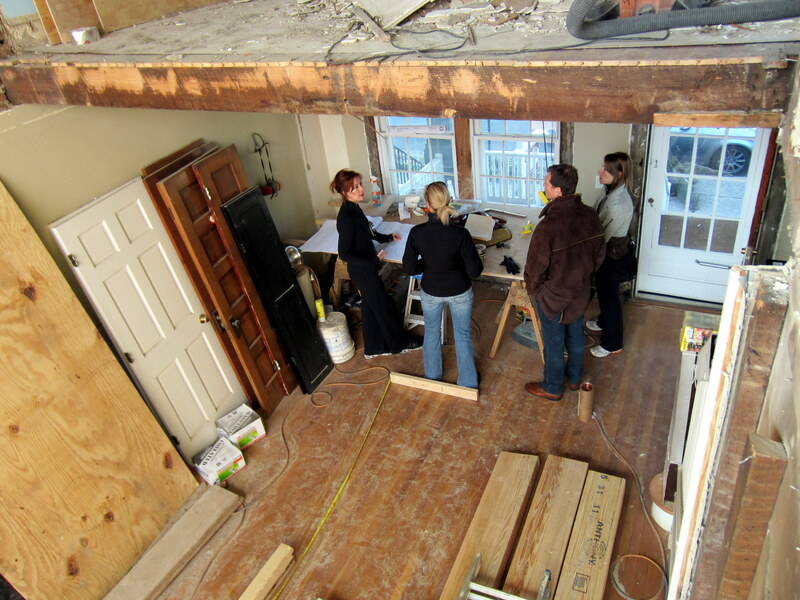 Some friends came over to check out the house-that-is-no-more and debate space utilization on the future first floor. 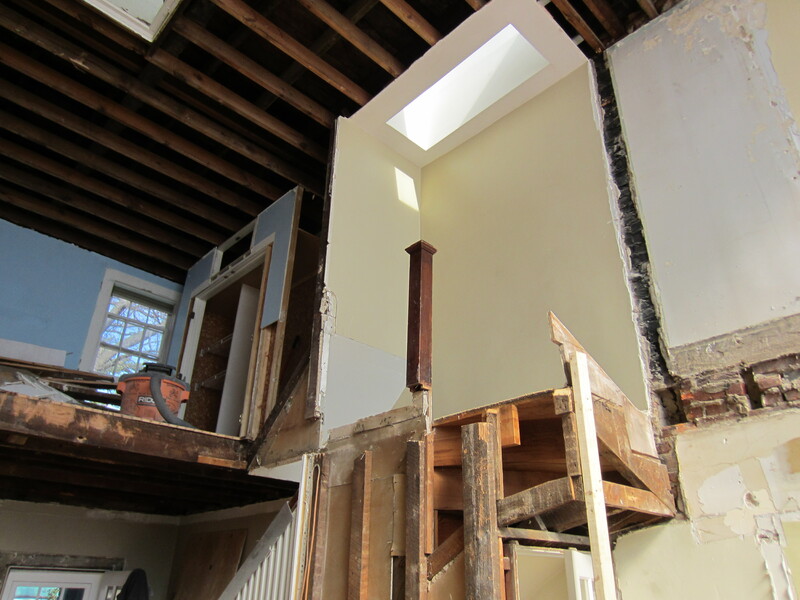 Someone had commented at the house that the remainder of the upstairs landing looked like a scene from Romeo and Juliet. 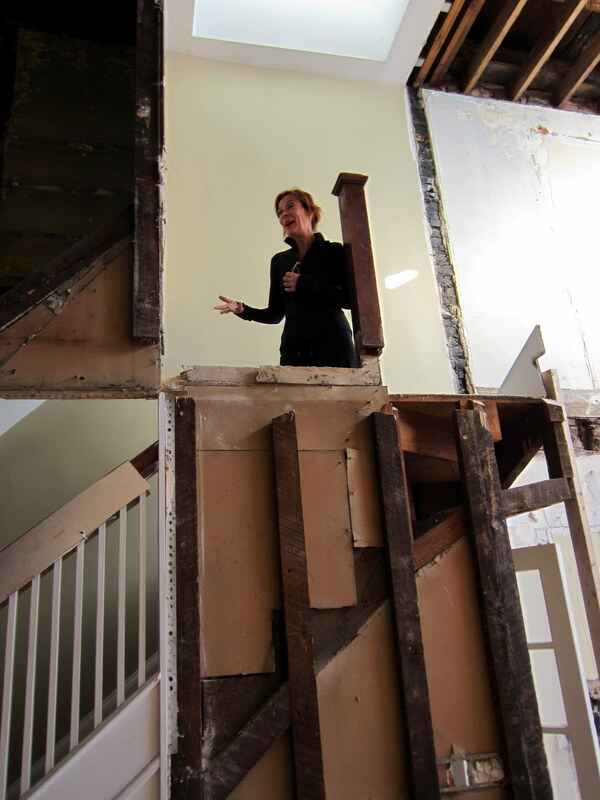 Definitely an apt comparison (and Phyllis makes a fine Juliet). I hope between this and the real and present danger to Buddy that we haven’t turned Nathan off to visiting our house when it’s done!